Linux Beach: How FAIR is this support for Russian aggression? How FAIR is this support for Russian aggression? Without even reading it you can see that they are saying that at a minimum, ISIS was where the Russians bombed and doing terrible things there. With that story they do two things at once. They appear to justify the Russian bombing, even if it turns out to be a mistake, and they put the spotlight back on ISIS and its terrible crimes, and the picture they provide is the proof. 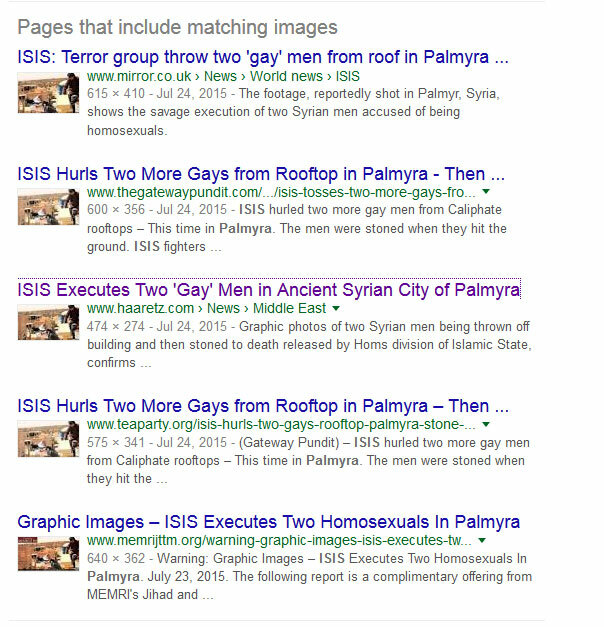 The only problem is that a Google search of this image quickly reveals that the consensus of opinion is that it presents ISIS crimes in Palmaya, not Homs as the FAIR caption incorrectly states. That caption is not the one used by the Daily Mail, that caption was created by FAIR, although, to be fair, the Daily Mail article does say the images were "thought to be in Homs, Syria." While Palmyra is in Homs province, it is far from the area stuck by Russia, as the map below shows. 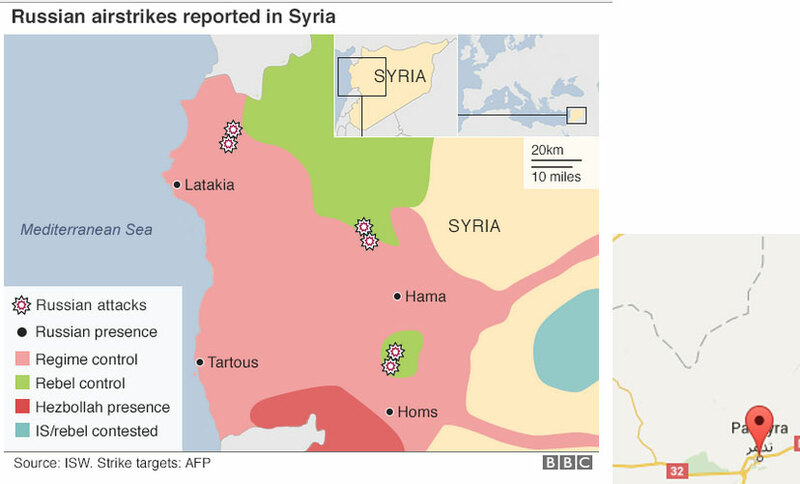 This is the BBC map of the area hit by the Russian air strike, I superimposed a map of Syria on to this to locate Palmyra on the BBC map except it wasn't even on the map! As you can see, I had to extend the canvas far to the right to show Palmyra. It is so deep into the blue IS area of the BBC map that they don't show it. The FAIR article also implies the picture was taken last week when it is more than 2 months old. I find this piece of fraudulent journalism one of the worst I have ever seen for two reasons: 1) It's coming from a group that use to be a watch dog for precisely this sort of thing, a group named Fairness and Accuracy in Reporting, 2) It is being done to apologize and excuse a new case of imperialist aggression in what is already the worst humanitarian disaster since World War II and is becoming the Paris Commune of the 21st century. What scum some of these "anti-imperialists" have become. Jim is a nut. I once tried to post a comment on one of his FAIR posts and was unable to. I assumed (incorrectly, it turned out) that FAIR was blocking me. I complained about this perceived slight on FB and he lammed in to me for "slandering" FAIR or some such. There followed a really unpleasant exchange which continued long after I'd copped to having been wrong about my difficulties in posting to his site. And now FAIR's replaying this scenario in Syria. 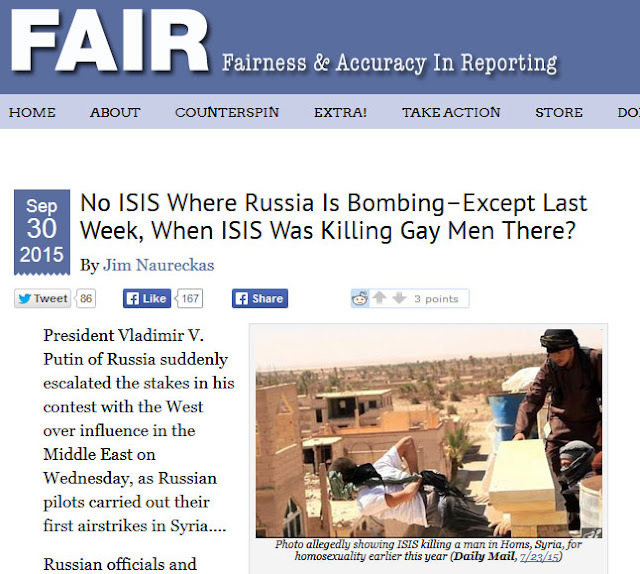 Putin bombs Syria and FAIR laces up its combat boots.